In Spain this past May, the usually dull and boring elections to the European Union’s Parliament produced a sudden shock to the political system. A new two-month-old party led by a 35-year-old, pony-tailed political scientist, appeared out of nowhere—but clearly from the Left—to sweep up a surprising 8 percent of the votes. The result was good to win five European seats, transforming the infant organization into the country’s 4th largest political force. 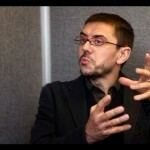 One of the party’s founders, political scientist Juan Carlos Monedero, spoke with us in late August. Juan Carlos Monedero. Photo Sarah Bienzobas. Why PODEMOS and why now? JCM: Those of us who launched PODEMOS found each other in the Faculty of Political Science and Sociology in Madrid, and in La Tuerka, a political debate program. We agreed that the model of Spanish democracy as it had been established in 1978 was exhausted, and we felt the same about representative democracy under neoliberalism in general. What compelled us into action in early 2014 was a series of different factors. First, the United Left (IU) unilaterally abandoned a project that had tried to bring different political forces together. Second, the European elections in May opened a window of opportunity. These are the only elections in Spain that bypass electoral districts, so that every vote counts the same, and they draw a relatively low turnout, so that fewer votes are needed for a seat. It was an attractive opportunity to try for an electoral breakthrough. Finally, Pablo Iglesias had become a very powerful presence in the media, while I had spent a couple of years traveling all over Spain to give talks. So a whole range of elements coincided: the possibility of a nationwide network, our media presence, the European window of opportunity, the exhaustion of the current regime—and the fact that some polls indicated that there was electoral room for a new political party. Like in a fairy tale, everything came together: the princess, the castle, the woods, the frog-turned-prince, the seven-league boots. All we needed was the kiss—which we got on May 25 in the form of 1,250,000 votes. You are part of the PODEMOS leadership but are not yourself running for office. JCM: Yes, and that is on purpose. Among the founding group we decided that only Pablo Iglesias would run. This is our way of showing the voters that we are not in this for a cushy political job. That there is a different way of doing politics. We are now working toward the constitutive congress, from which an elected leadership team will emerge. 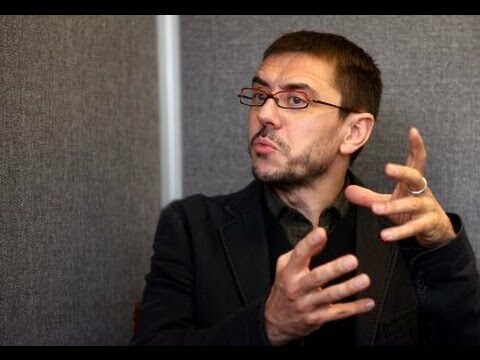 Juan Carlos Monedero, born in Madrid in 1963, studied Economics, Political Science and Sociology at the Universities of Madrid and Heidelberg, and earned his Ph.D. with a dissertation on the collapse of the German Democratic Republic. He’s been teaching at the Universidad Complutense de Madrid since 1992. Over the past 15 years, he has served as political consultant for the Venezuelan government and the Spanish United Left coalition. More recently he has also combined his scholarly and political work with a maverick media presence as a columnist, commentator, blogger, and television anchor. Together with PODEMOS leader Pablo Iglesias he hosts La Tuerka, a feisty political debate program broadcast on local TV and the Internet. Monedero, a fearsome debater, often wears black T-shirts with political prints, has an image of Gramsci on the back of his iPad, and likes to acknowledge his debt to the progressive tradition by quoting from memory. In 2011 Monedero published a scathing critique of the state of post-Franco Spanish democracy, The Transition As Told to Our Parents (La Transición contada a nuestros padres) that became a bestseller. Last year he published an Emergency Seminar in Politics for Decent Folks (Curso urgente de política para gente decente), a lyrical call to civic mobilization and collective political action. Pablo Iglesias Turrión, born in Madrid in 1978, holds academic degrees in Law and Political Science and earned his Ph.D. in 2008 with a dissertation about collective action in a post-national context—all at the Universidad Complutense de Madrid, where he has also taught. 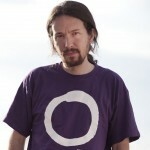 Between the ages of 14 and 21, Iglesias was a member of the Union of Young Spanish Communists (UJCE). He serves on the board of the CEPS Foundation, a progressive think tank. As one of the five top PODEMOS candidates, Iglesias was elected to the European Parliament in May 2014. In June, the European United Left elected him as its candidate to the presidency of the European Parliament. A frequent columnist, commentator and blogger, Iglesias—who shares his name with the legendary 19th-century founder of the Spanish Socialist Party—hosts the political debate programs La Tuerka, (broadcast on local TV in Madrid and at www.latuerka.net) and Fort Apache, which appears on the Spanish-language channel of Iranian public television and online (www.fortapache.es). 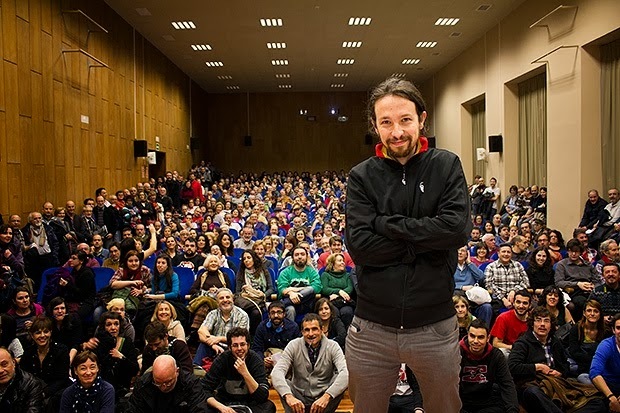 In June, when PODEMOS held an online election in which some 56,000 voters participated, an 87 percent majority voted to have Iglesias and his team lead the party toward its first citizens’ assembly, to be held between September and November of this year. How important has your experience in Latin America been for building PODEMOS? JCM: It has been absolutely key. Latin America suffered the fury of neoliberalism 25 or 30 years before we did: it saw rising borrowing costs, benefit cuts, the rich evading taxes while sales taxes kept increasing, massive losses of mortgages and homes. Latin America was a mirror that we could not afford to ignore. But we also learned from Latin America how to respond to institutional collapse. What do you do when representative democracy has ceased to be representative, but when its institutions are still there, controlling the banks, the political parties, the media, international relations, the world of money, the universities? What we learned from Latin America is that there is only one way to break through the gridlock of dysfunctional institutions: appealing directly to the people. We needed tools that would allow Spaniards to organize their discontent and turn it into political energy. We had to offer them the opportunity to express their frustration through their votes. We also learned from Latin America that it was no longer productive to speak in terms of Left and Right. The only people who still understood the world in those terms were party members and academics. Latin America taught us that, if we wanted to build new majorities, we had to do away with that framework. This also meant that we had to define those majorities beyond the working class. Of course, it’s not that the working class does not exist. If on any day, in any of our countries, the workers would not show up at their jobs, the whole system would collapse. But 40 years of neoliberalism have skewed perceptions. The working class does not exist if it doesn’t think of itself as working class. An enormous segment of the population does not understand the world and themselves in the Left’s traditional political terms. We realized that we had to communicate with the people in a language that the people understood. PODEMOS represents a new style of doing politics. You are not afraid to use humor, or even poetry. You call things by their name. You relish a good fight. JCM: PODEMOS is different because we are normal people and we talk like normal people. We don’t hide behind suits and ties. Our lack of political correctness has allowed us to connect with an important part of the citizenry. The West—and this is crucial—has left the space of the politically incorrect to the extreme Right. This explains the rise of the Tea Party, of Marine Le Pen in France or Golden Dawn in Greece. The people are angry because their lives have become miserable. And they are disoriented because the traditional political coordinates have been blurred. If, on top of that, you don’t provide them with tools to express their anger, what do they do? They turn toward those that do give them those tools, which is the extreme Right. A third element is our lack of fear. In Spain, the politics of fear has long been a State policy. We have 150,000 dead buried in roadside ditches. We have the second largest number of mass graves and disappeared in the world. Repression has been constant here. A typical phrase you’ll hear from a parent is: “Son, daughter, don’t call attention to yourself. Don’t stand out.” As my friend Emilio Silva says: In our effort to go unnoticed we have become insignificant. The neoliberal model has been so successful because it has convinced us that there is no alternative. And it has been able to do so because we have delegated politics to the politicians. PODEMOS urges the people to take back the reins of politics. We say: “Look, this is the situation. It’s not pretty. It’s complicated, and all the tools we have are our own hands. So we better get working. Will you join?” And as it turns out, if you place your trust in the people, they will place their trust in you. The PODEMOS team celebrates its May election result. Yours is a different kind of populism. JCM: It’s an intelligent populism. We are providing the people with the tools to interpret themselves and what’s happening around them. And we’re honest. We tell people that they should only support us if they are willing to join us on a journey of structural change. And there we have really no choice, we have to be sincere. There is no way we can change anything if we don’t have the support of a people that is aware, and willing to put themselves on the line to transform the world. The sectors we’re up against are very powerful. The only thing we can tell the people is this: “Look, it’s really important that you vote. But there is much more work to do after that.” In practice we are doing the only thing possible to actually change our countries: we are inviting the citizenry to share in the responsibility for government. The neoliberal model has been so successful because it has convinced us that there is no alternative. And it has been able to do so because we have delegated politics to the politicians. It is they who, like a new priesthood, tell us that this is all there is. We, by contrast, urge the people to take back the reins of politics. It makes no sense that so many U.S. senators and representatives are millionaires. How can someone claim to represent you when they belong to a different planet? We say: “Look, this is the situation. It’s not pretty. It’s complicated, and all the tools we have are our own hands. So we better get working. Will you join?” And as it turns out, if you place your trust in the people, they will place their trust in you. PODEMOS is not afraid to speak of Spain as a nation that should fight to regain its sovereignty. Is it possible to change things in Spain without changing Europe? JCM: The last time the European establishment got scared was when Syriza, in Greece, was about to win the elections. Until then the European Parliament couldn’t care less who won or lost elections because whether it was party A or B, they were two sides of the same old record. But Syriza was different. We realized that the only way to really confront Europe was by gaining power at the level of the nation. But we also realized—again, thanks to Latin America—that we were lacking in the construction of a national-popular subject. Why? Because we have long left the definition of Spain to the Right, which constructed a centralist, national-Spanish, Catholic Spain. But Spain is not like that at all. Since the period in the fifteenth century that we call the Reconquest, Spain has been an aggregate of territories that were never fully locked together. Under the leadership of Castile, the creation of the Spanish state was marked more deeply by the need to convert heretics than to fashion Spaniards. Meanwhile, Catalonia did build a national identity. This is why Spain is a nation of nations. The Right does not understand this. For us, therefore, the only way to reinvent Spain is through a form of federalism. And from that federalist basis, from a new form of regional integration, we can begin rebuilding Europe. In our global world, nation-states cannot survive without some form of supra-national integration. That is absolutely clear. But those larger forms of integration have to allow for the emancipation of each individual country. The free trade agreements promoted by the United States benefit the U.S. and small minorities in Latin America. But they hurt the majorities. The European Union, right now, benefits the central countries, especially Germany, while it hurts the countries of the south. The way we see it, we need to construct a federal Spain that is strong, integrated, and coordinated, allowing us build a southern or Mediterranean axis that can serve as a counterweight to Central Europe. In no way do we speak of leaving the Euro, or getting out of Europe. What we are talking about is a reconstruction of Europe. And for that we need to be strong. Fortunately the citizens of Greece, Portugal, Italy, and France are as conscious of this as those of Spain. 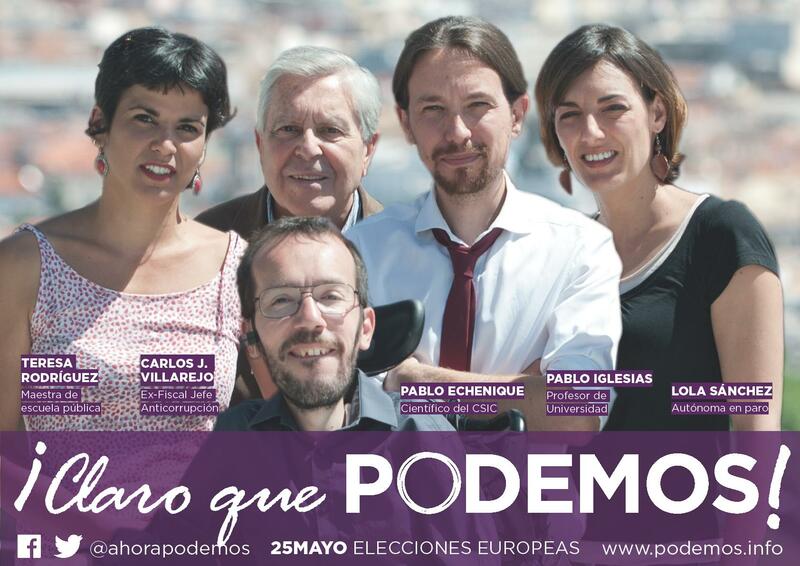 PODEMOS’s poster for the European elections did not feature the usual airbrushed fake smile of a graying leader in a suit. Instead, it presented five candidates, four of whom were born after Franco’s death: political scientist Pablo Iglesias, 35; an Argentine-born physicist, 35; a public school teacher with a degree in Arabic Studies, 32; an unemployed political scientist, 35; and the 79-year old Carlos Jiménez Villarejo, a prominent retired public prosecutor known for his fight against corruption. The party has organized itself in some 400 local assemblies, which it calls “circles,” and has effectively mobilized social media like Facebook and Reddit to set up something that comes close to a direct democracy. This also means that its platform is still in the making, subject to a broad process of consultation. Some have called PODEMOS populist, but as the philosopher José Luis Villacañas has pointed out, the party does not try to appeal to voters’ emotions. Rather, it appeals to their intelligence, seeking collectively crafted alternatives. All this is new in Spain. The country’s 36-year-old democracy was built on a compromise between Francoists and opposition leaders, and largely designed to limit upheaval and constrain voters’ role to casting a ballot every four years. Spain’s electoral laws favor established parties over smaller ones and rural areas over cities. Constitutional change is all but impossible. Since the Transition of 1978, its political system has spawned a tightly knit class of party professionals deeply invested in the status quo and determined to hold on to power. Designed to create stability, the system has instead encouraged widespread corruption. It has also widened the gap between politicians and their constituencies, and eroded the voters’ trust. Starting in the early 1990s, the country has seen a series of corruption scandals involving both major parties. Yet impunity reigns: Almost all public officials enjoy a form of limited legal immunity by which they can only be tried in higher-level courts. The 2008 economic crisis, which has hit Spain harder than almost any other country, has further sunk the public’s trust. Meanwhile, a battery of ruthless, EU-imposed austerity measures and a 25 percent unemployment rate—approaching 50 percent among the young—dashed all hope. The labor party (PSOE) has been impotent in the face of the neoliberal European power bloc. With no real alternative to offer, its poll numbers have been as stagnant as those of the governing Right. The immediate origins of PODEMOS can be traced to public protests that emerged on May 15, 2011, which helped inspire the Occupy movement in the United States later that year. The participants in the “15-M” movement called themselves indignados and demanded “Real Democracy Now.” They purposely kept far from existing party structures. PODEMOS, on the other hand, tries to strike a balance between the energetic idealism of 15-M and the recognition that change requires political work. It has positioned itself as the angry voice of the people (la gente) against the political, economic, and cultural establishment, branded as The Caste (la casta). 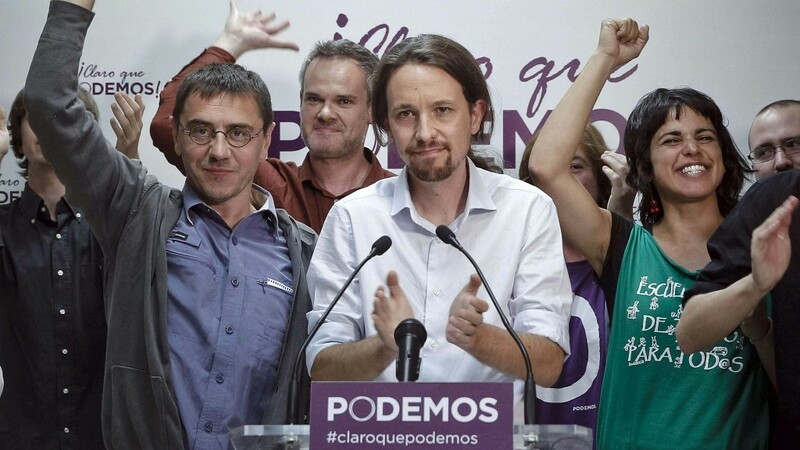 PODEMOS has called for measures that buck neoliberal common wisdom and austerity, finding inspiration in the traditions of democratic struggle for workers’ and civil rights. Private profit, it believes, should never be allowed to trump the public good. Similarly, PODEMOS would prohibit profitable corporations from firing people, favors of a 35-hour work week, and has called for a return to a health care system controlled by the state. PODEMOS is preparing its first citizens’ assembly—a deliberative process that is scheduled to last two months, from September 15 until November 15. While it’s still unclear to what extent PODEMOS will participate in the municipal elections of May 2015, it is gearing up for the next general elections, scheduled for December 2015. JCM: It’s true that practical politics is incompatible with being an intellectual. We haven’t fared well in politics since Plato’s days. But it’s also true that intellectuals are out of touch with the people. Intellectuals sit at their desks instead of working in the kitchen. That is not my case. The Faculty of Political Sciences where I work has always had one foot in theory and one in practice. The academy says our commitment to reality contaminates us. Politicians say that our commitment to the truth makes us inefficient. I think both are wrong. The academy tends to confuse the status quo with the only possible state of things. Politics, on the other hand, often has to negotiate with the truth. People who deal in truth have a hard time in politics. Take a religious person. A Catholic believes Jesus was the son of God, a Jew doesn’t even believe he was a prophet. What is there to negotiate? That instead of God’s son, Jesus was his second cousin? The only way for politics and intellectual work to coexist is in a constant dialectical struggle. I live that struggle every day. What inspiration do you find in the past, particularly the fight against fascism? JCM: When it comes to antifascism there is a major difference between Spain and the rest of Europe. Antifascism is an inextricable part of Europe’s democratic DNA. It’s impossible to understand the French Constitution of 1946 without taking into account the National Council of the Resistance. The same goes for the Italian and German Constitutions of 1948 and 1949. In Spain, however, the antifascists are little more than an urban tribe. After 40 years of bloody dictatorship—executions continued until a couple of months before Franco’s death—we’ve had 35 years of forgetting. We know that it’s up to us to recover our country’s history. Without it, it will be very hard indeed to build a decent democracy. But it’s not going to be easy. The situation is like that of a child who was robbed from his family. You can’t just ring the doorbell one day and tell him that the people he considers his parents are in fact the assassins of his actual parents, however much you have truth and reason on your side. When the indignados took to the streets in May 2011, something curious happened at the Puerta del Sol in Madrid. When someone flew a Republican flag, someone else requested that it be taken down because it was divisive. Were they right? After all, the indignados took their name from a book by Stéphane Hessel, the French writer who fought fascism in the Resistance. The kid who claimed that the Republican flag was divisive probably didn’t know that the first tanks to enter a liberated Paris in 1944 were driven by Spanish Republicans who had fought in the Ninth Division with General Leclerc. That’s where the democratic DNA of Spain should be, although currently it isn’t. We’ve got our work cut out for us. The neoliberal model has worked very hard to wipe out history and turn it into a kind of decaffeinated theme park. It has prevented us from connecting with the historical anger and frustration that anticipated our current anger and frustration. What does fascism look like today? JCM: Let’s take a step back to 1945. The Right had turned to fascism in the interwar period, and it had been soundly defeated. If you look at the Declaration of Human Rights of 1948, you’ll see it’s actually quite socialist. But the effort of the social-democratic parties in the West to build a somewhat more decent world had a fundamental problem. It built democracies on the inside while allowing for poverty and dictatorship on the outside. During neoliberalism, which starts in 1973, the social-democratic parties actually became neoliberal parties. This is why over the last 40 years we have seen a huge, rigged battle between two political forces in which one has been hypocritical and the other more sincere. You might say that the victory of the neoliberal Right was more deserved: at least they did what they said they would do, while the social democrats refused to admit that they were throwing all their ideological commitments overboard. That state of denial couldn’t last, and it began to unravel in 2008 with the collapse of Lehman Brothers. So to answer your question: Since 1975 we have handed over democracy to the financial system, which has turned into a monster. And that is the new fascism. We either face the battle against the financial monster with the same sense of purpose as we faced the battle against the fascist monster in the 1930s and ‘40s, or it will win. The fight ahead is as difficult as the fight against fascism was. I like to say that we are pessimists that haven’t given up on hope. We’re pessimists because the struggle is tough. But we are hopeful for three reasons. First, because if we had no hope we’d be defeated already. Second, because unlike the 1930s we do not have an enemy that justifies authoritarianism, as was the case in the Soviet Union then. And third because, as Marx would say, capitalism generates its own contradictions, and has made possible alternative means of communication allowing for a level of consciousness that did not exist in other moments of history. It’s our hopeful pessimism that will allow us to find reasons to keep up the fight. This is an extended version of the interview (pdf) that appeared in the September 2014 print issue of The Volunteer. Sebastiaan Faber is Chair of ALBA’s Board of Governors and teaches at Oberlin College. I am working in the picture desk a french newspaper called Le Monde. I am interting by the picture of Pablo Iglesiais on the top of this article (with a lot of person behind him). Do you know the name of the photographer ? Do you know how I can contact him to have the high resolution and to by the picture for a publication? Its urgent.